Charlie Chaplin‘s was nearing the end of his career when in 1953 he made a drama that could almost be considered semi-autobiographical in nature had the actor’s box office prowess not remained so strong. Limelight is about an aging stage comedian who in 1914 London finds the tramp act and others from his career-long routine no longer hold the same draw with the current audience demographic. Calvero remains a name known by all of London as a great comedian, but when the man actually can find a booking, he seems no better than an unknown. His life takes a signficant change, however, when he discovers upon drunken return to his boarding house that the woman in the first-floor flat has gassed herself in a suicide attempt. Against the landlady’s objections, Calvero (Chaplin) cares for this young Thereza (Claire Bloom) and takes her into his home once the landlady has rented away her own room. Thereza was a ballerina who after becoming ill lost the strength needed to perform. Her suicide attempt has also left her with leg paralysis that the doctor diagnoses as purely psychological. Thereza continues to look down upon her life circumstances until Calvero returns home from a new booking that went so poorly it was cancelled after one night. She demands her newfound friend fight for his livelihood and in doing so finds she can stand on her own recognizance. With no future bookings laying in Calvero’s future, Thereza takes up the breadwinning by gaining a chorus dancing job. She soon becomes the lead dancer in a ballet at the Empire Theater and arranges for Calvero to play one of the clowns that appears in the show. The composer of the ballet happens to be a young man whom Thereza was in love with years prior when he was a poor, struggling artist and she a shop girl at a music store. This Neville, played by Chaplin’s son Sydney Chaplin, is instantly captivated by the woman from the past, but Thereza is aloof because she has decided she is in love with Calvero and, despite their age difference, has asked him to marry her. Calvero is resistant and quickly realizes that Neville would be a better match for the young woman. Limelight is a great take on the “aging star” scenario because is balances the limelight needs of both an older performer and a young one who thinks her career is also over. The film has another element to it also, that of the unconventional relationship between the young woman and the man too awkwardly older than she to be considered a legitimate love interest. Chaplin plays the part well so as to eliminate any romanticism between the characters, even when Calvero is referring to Thereza as his wife for appearances sake. When Thereza becomes a big star, the natural assumption is she would find an apartment of her own, yet the couple continue their uncommon home life. Bloom is terrific as Thereza, a role Chaplin picked her for that would start her down a long career of film and TV roles on top of the theater work in which she was already engaged. Her emotional scenes, of which there are several, can lean to the hysterical side, which becomes obnoxious, but she is otherwise the most beautiful thing to hit the silver screen. Limelight was the only movie in which silent cinema greats Chaplin and Keaton appeared together. Keaton appears only for the ending scenes and shows little of the acrobat entertainer but all of the stoneface we knew from his early work. Although Chaplin had made a hugely successful career for himself by remaining independent and writing and producing films like this, Keaton had signed on with MGM and lost his celebrity ranking when talking pictures came along. The flick was the last one Chaplin would make in the U.S. because its distribution was bungled by an investigation by the House Un-American Activities Committee into Chaplin’s possible communist sympathies. Many theaters bowed to pressure not to release the film on schedule, and because it did not open in Los Angeles in 1953, it was not eligible for the Academy Awards. It would later win an award for the score, written in part by Chaplin, in 1957 when the movie finally showed in the California city. Limelight nevertheless took many international awards. If you need a criminal hideout, what better place to set up than a “haunted house”? At least that’s what a gang of baddies think in The Haunted House short silent film. 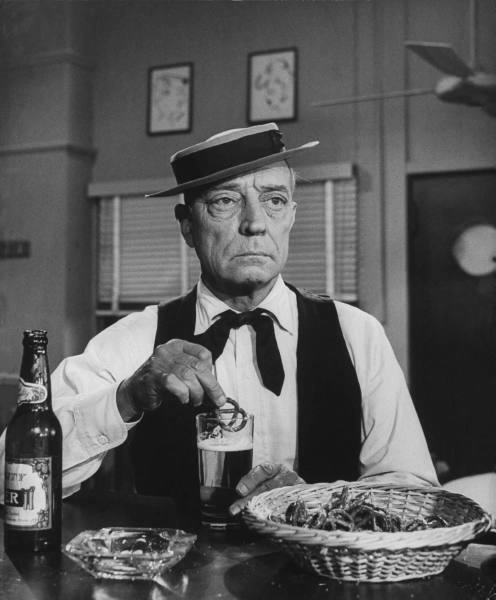 Buster Keaton is a bank teller, and I think we can say right off that this is a bad profession for such a clumsy dope as he. While trying to count money out to a client, the man spills a large jar of glue inexplicably situated without a lid on the counter. The contents land upon his pile of money which is now becoming stuck to just about every part of Buster’s body. When a host of bank robbers arrives, Buster struggles to put his hands up as they are adhered to his pockets. The man foils the robbers but others think he has just held up the establishment, so he is chased and ends up at the haunted house. Also driven to this locale are a couple of actors who have been run off the stage for a bad performance. The domicile is not actually phantom-ridden as the criminals see their ruse merely as a way to dissuade police from investigating it. They pull pranks, such as a staircase that becomes a slide, but Buster is ultimately scrappy enough to tackle the obstacle and elude the bank officials and police. Buster meets a whole host of ghouls, including a couple of creepily dressed skeletons who reassemble a man, and he event battles satan. When the man realizes the ghosts are merely actors, he borrows one of their outfits and holds up the bank official who is after him. That man, however, knocks our hero out with a blow to the head, and Buster ascends to heaven, then to hell, before awaking. I think what made Keaton such a good entertainer is that he acted as writer, director and star. Just as Keaton could not have written or directed another actor into giving the same performance or one that is so effective, so too could no other writer or director have known at this early stage how to write to the man’s strengths to create such a unique outcome. Keaton’s greatest asset was his athleticism and acrobatic skill. No one else could make slipping on a banana peel or sliding down a staircase look so natural despite its exaggeration. Keaton knew what he was capable of and how he could make people laugh, so he wrote his stories and conceived of sets around that. The plot of a Keaton story is much like that of a good Marx Bros. movie: It does not really matter. What will make you laugh are the stunts (and in case of the Marx Bros. the dialogue) that has nothing to do with the plot. In a time when cinema technology had yet to advance to the point that we could synchronize sound with moving images, I find it amazing the effects movie makers were able to create during this very rudimentary stage of the medium. Buster Keaton in directing himself in Sherlock Jr. in 1924 boggles the mind with the special effect he was able to create. No only does he duplicate himself on screen, but he walks into another movie and magically changes his surroundings in the blink of an eye. Buster works as a movie projectionist and is reading up on how to be a detective. He is in love with a young woman whose affections are also sought by another man. That man, “The Rival” (Ward Crane), steals a pocket watch to get money enough to buy “The Girl” (Kathryn McGuire) a gift and frames the crime on Buster. While sleeping in the projection booth at the theater, Buster walks out of his own body and gazes at the screen where he sees the main characters transformed into his love interest and his rival. He walks through the theater and enters the movie screen where he is then transported from a garden, to a desert, to a cliff, etc., all while stumbling and nearly falling off said cliff. He eventually enters the movie’s plot as Sherlock Jr., a great detective, out to solve the case of the missing pearls. The villains in the movie, which include The Rival, have all sorts of deadly traps set for the sleuth, but he defies them all. His assistant, Gillette, also helps him in stalking the criminals. In one scene, Sherlock Jr. arranges some clothing –a dress, shawl, wig and hat– inside a flat round package and places it upright on the outside windowsill of a building where the criminals are hiding. He enters the place, angers the villains and leaps through the window to escape. When he hits the ground, however, he is slumped over disguised as an old woman. Later Sherlock will leap through an open briefcase held by Gillette at his abdomen. It is not terribly difficult to deduce how this stunt is accomplished, but it is fascinating to see nonetheless. Not only does Sherlock win the battle, but Buster is woken from his dream by The Girl, who has herself solved the real-life mystery of who actually stole the pocket watch. An adorable ending has Buster in the projection booth taking pointers from the lovers on the screen as he embraces and kisses The Girl. The most interesting and complicated effect used in Sherlock Jr. was after the man enters the movie screen and finds his background changed a dozen times. Buster had to remain absolutely still while the sets were altered around him and the shots were then compiled to make the transitions look instantaneous. The result, for instance, is Buster moving to step down a set of stairs only to step off a garden bench and fall flat. The sets could not have been easy to change either as they were not simple. The desert set up has a sandy hold the man hides in while a train rushes by. Another makes him appear in the middle of the ocean. I cannot imagine the labor required for that few-minute exchange. Of the Keaton films I’ve seen so far, this hour-long flick is certainly the most fascinating. Movie makers were so creative from the very start of the motion picture industry in finding unique ways to expand the possibilities movies presented. Besides being greatly funny, Sherlock Jr. stands as a prime example of movie history. How many windows can Buster Keaton break with his movie camera before the joke gets old? That seems to be at least part of the plot of the first movie the silent star made under a studio contract, The Cameraman. Buster’s profession of making tintype photographs for the occasional person on the street is insufficient in a world of motion picture cameras, or so he finds upon meeting Sally, played by Marceline Day. After tracking down this lovely lady, whom he met in a crowd where their bodies were crushed so closely together that the man took the occasion to repeatedly smell Sally’s hair, Buster decides a job in moving picture journalism could be for him. As MGM News Bureau receptionist Sally informs him, however, he must have his own camera. Unable to afford a $2,000+ device, Buster instead trades in his still camera for a run down, old version. In trying to find his way to his first potential assignment –a fire– Buster instead confuses a police officer who will throughout the film be befuddled by this lunatic’s shenanigans. Buster manages to score a date with Sally, and the two head to a swimming pool/beach area. Here, Buster spends an extended amount of time sharing a dressing room with a burly gent (Edward Brophy) as the two tangle in one another’s clothes and limbs in attempts to change into their swimwear. The routine is absurd but full of laughs for the audience as the two go about this task as if it were utterly natural, if not inconvenient. Once out of the dressing room, Buster’s overly large bathing suit becomes a pickle for him in the waters as the outfit wades away and he is forced to steal pants off a large woman donned in full-body waterway. Buster nearly loses his girl to another at the pool, but the man sends his competition swimming after a handkerchief instead. Buster gets his big break with a tip on a likely violent outbreak during Chinatown’s new year celebration where he finds himself running his camera in the midst of flying bullets. He also picks up an eerily human-looking chimp dressed as a sailor, who also escapes harm on the back of Buster. Too bad the film cartridge was empty. The Cameraman is among the great Keaton silent, full-length flicks. It contains that famous sequence when the cameraman positions himself atop some scaffolding only to have it tilt and collapse forward to the ground (what a shot that would have been on his film!). All his efforts are for the love of the girl, but a profession involving a three-legged prop is doomed to disaster for such a clumsy character. Keaton does a great job of playing those blokes who while not necessarily dumb are at least oblivious to the impact of their actions. 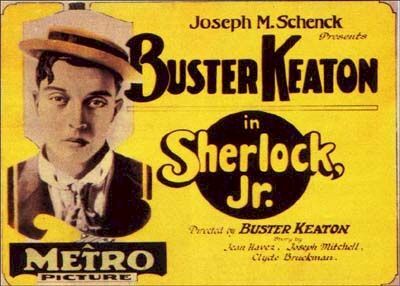 This flick was the first Keaton made under a studio contract as he had created all previous films under his own direction and writing. He was strongly advised against signing with MGM, but saw the opportunity to relieve himself of certain duties, including securing financing, as a plus. Although The Cameraman was not negatively impacted by the arrangement, the studio would prove to be a headache for the star down the road. I have spotted Buster Keaton in a number of talking pictures later in his career when he showed up as a supporting player, but I have now had my first silent Keaton experience –and it was a doozy. I have yet to really delve into the major comedy acts of the silent era, which is to say I have also only seen Charlie Chaplin in a speaking role. So to my slight surprise, I found The General to be supremely entertaining and funnier than I thought silents could really be. Keaton as Johnnie Gray, a southerner, operates a train engine called “The General” and has a girlfriend whom he might love second to his train. When the Civil War breaks out, girlfriend Annabelle Lee (Marion Mack), pushes Johnnie to, like her brother and father, enlist in the Confederate army. Seeking his gal’s approval, Johnnie races to the enlistment station and fights to be the first in line, but upon hearing he is a train engineer, those in charge think the small man would better serve the cause in his current position. Annabelle thinks her boyfriend is just a coward and a liar and so tosses him aside. Later, Union soldiers storm Johnnie’s train when all passengers have exited for a meal break, all except Annabelle, that is. So Johnnie chases after his engine on foot, on bicycle and on those little push carts that move on railroad tracks (whatever they’re called). He eventually reaches the next depot and calls the soldiers stationed there to hop on another train and chase after the enemy. Foolishly, Johnnie forges ahead with only one car attached to the engine, leaving the army behind. An absurd chase ensues with Keaton most famously sitting on his engine’s cow catcher and picking up large wooden debris from the tracks. When the Union soldiers discover Johnnie’s train is in fact only occupied by the one man, they laugh and stop for the night in the midst of some rain why Johnnie runs away to hide. Unfortunately, he hides in the home where the enemy soldiers will camp. It is only at this point that he even discovers Annabelle has been kidnapped. Heretofore he has just been trying to get his train back. So in the night, Johnnie and his gal escape into the rain and in the morning steal back “The General.” Now it is the northern army that is chasing Johnnie and a host of additional bad and good luck leads our hero to safety and to the South winning a battle against the North. Buster Keaton performed his own stunts, which in itself makes up a huge amount of this film’s appeal. All of his leaping, falling, climbing, and hauling of firewood is impressive. Obviously with a silent movie, the physical humor reigns supreme, but for some instances, Keaton makes us laugh just with the expression on his face. There is an impressive scene after Johnnie sets a bridge ablaze when the Union army’s train crosses it and the structure collapses into the river. The scene cost something like $42,000 to film and would remain as a tourist attraction in Oregon where the movie was filmed until the scrap metal remnants were collected for WWII efforts. The battle scene at the film’s end was also responsible for a fire that took over the surrounding woods. Keaton, who also directed, stopped filming so cast and crew could douse the blaze. Released in 1927, The General came out the same year as the first “talking picture”, The Jazz Singer. By 1929, the sound film era was truly in full swing, thus putting many movie stars unable to adapt to the new form out of work. Keaton, as I mentioned, was not one of them, although his parts would be much smaller as his career went on. George Marshall was the director behind The Silent Partner, a comedy about a silent movie star long forgotten. When told that the silent actor would be played by a great from those days of film, my first thought went to Buster Keaton, and I was correct. Unlike many of his silent-era counterparts, Keaton continued his career into talkies, although he can usually be spotted in supporting or cameo roles. The story for this episode is a bit haphazard. Keaton, as ex-actor Kelsey Dutton, is seated at the counter in a mostly empty bar where a handful of characters are either very interested in watching on TV the Academy Award ceremony taking place across the street, or not at all. Being honored during that night’s ceremony, hosted by Bob Hope as himself, is director Arthur Vale (Joe E. Brown), who cannot help but give credit for his career to Dutton. We are entreated to a flashback when Dutton unknowingly barges onto the set of Vale’s film to rescue a woman in a smoking building. The action proceeds in typical silent comedy style and Vale hires the man as a star. Returning to present day, the Oscar broadcast next features a short film the team made. Dutton is a janitor at a saloon and is in love with the singer atop a piano who inherits a large sack of money. Cowboy robbers show up however, and wrestle with the woman and Dutton, who is continually kicked in the rear by a horse. The present-day patrons at the bar soon realize they are in the company of the man on the screen and one woman (Zasu Pitts) calls Vale to notify him of his silent partner’s whereabouts. Vale arrives at the bar and takes his pal to the Oscar stage. Less interesting was Lincoln’s Doctor’s Dog, directed by H.C. Potter. The story was crafted based on a mantra of publishers at the time (and maybe still today). Publishers knew that any story about medicine, animals or Abraham Lincoln were surefire best sellers, so naturally, a story called “Lincoln’s Doctor’s Dog” would be the epitome of a hot story. Unfortunately, I struggled to stay awake. Charles Bickford plays Dr. Stone to Robert Ryan‘s President Lincoln. The doctor attends to the political leader who is low of spirits and perhaps ailing in other ways. He is ordered strict rest, but cannot seem to keep away from the various documents he insists on reading. On his way home one night, Dr. Stone obtains a golden retriever puppy and delivers it to Lincoln as a birthday present. The pup, while having the president chasing it all over his bed, has a grand effect on the man’s health and attitude. Later the dog subdues an entire room of politicians and the doctor declares that the dog has done a service to the United States.